Object storage allows organizations to deal with the massive amounts of data generated by IoT and AI applications, but it's not the best fit for frequently accessed data. and AI. Applications with huge data sets drive the need for a storage system that can expand as quickly as incoming data, and an object storage architecture can help. Object storage simplifies unstructured data management. "Using a flat address space, object storage can scale to higher capacity levels, while continuing to provide high levels of resiliency by using erasure coding," said Stefaan Vervaet, senior director of strategic alliances and market development at hard drive manufacturer Western Digital. "It offers a foundational architecture for creating the right private and hybrid cloud storage environments to capture, preserve, access and transform data." Object storage architecture also allows adopters to add capacity when they need it and where they need it globally, and then, it enables them to manage everything as a single storage resource. "It provides limitless scalability, while demanding very little management, and does so at a low price that rivals tape," said Jon Toor, chief marketing officer of enterprise storage provider Cloudian. Object storage architecture is unique in that it provides high availability across geographies with eventual data consistency, meaning the data will be the same everywhere. "With object storage, it is possible to have availability to data even when an entire data center is down or inaccessible, because object storage uses erasure coding or replicas across multiple data centers," said Jonathan Halstuch, co-founder and COO of enterprise data management technology provider RackTop Systems. Files that are written once and never or rarely modified can be effortlessly shared over the web with an object store. "Great examples of object storage are online videos and images, where they are posted once and viewed many times on the web. Rather than put a file on a NAS and expose it through a web server, object storage allows you to just use the web link to the object," Halstuch said. Another area where object storage architecture offers great value is in the extraction and preservation of value from unstructured big data sets. For example, internet of things data must often be processed nearly instantaneously -- wherever the data temporarily lives -- to yield actionable insights. "For longer-term analytics and machine learning, storage solutions, like object storage, [which are] designed for large data sets, will be essential and will need to prove ROI for longer-term gains and business value," Vervaet said. Transitioning to object storage architecture is relatively easy because many object storage systems simulate a file system directory structure, said Thomas Hazel, CTO of Chaos Sumo, an object store technology developer. "As a result, the transition from another storage platform to object storage is truly a natural act," he said. "All it takes is copying the data from one platform to the other." Because unstructured data continues to grow at a nearly unmanageable rate, IT should start transitioning to object storage as soon as possible, Vervaet said. "However, as with any project, IT will have the highest chance of success by starting with smaller applications and creating a backup of data in a different environment," he added. "This leaves the team some room for trial and error and a chance to perfect their object storage strategies before scaling." Many IT people still don't have a solid understanding of object storage because the block-and-file paradigm has existed for so long. This can be an issue for organizations looking to hire staff members who know how to deploy and manage the technology. Object storage is "a completely different way of accessing data," said Clayton Weise, director of cloud services for technology integrator Key Information Systems. "Education is important, so organizations may have the challenge of hiring someone who is already fluent in this type of storage or training existing IT personnel." Despite its manifold benefits, object storage architecture isn't always a good fit. "If data is needed [in] real time on a constant basis, then it is not a good idea to move to object storage," Weise said. "Object storage can be used as a repository where IT pros can access information, but if it is something that they will need on demand, then it's in their best interest to use some other form of storage." Object storage by itself is also not an appropriate option for data that is frequently modified. "Unlike a NAS or SAN that provides guaranteed consistency, object storage provides eventual consistency," Halstuch said. "This means that, if you read an object that was recently modified, there's no guarantee that it's the most recent copy if there are frequent changes." The world is generating ever-increasing amounts of data. At the same time, there is an acceleration in information richness and immediacy. "These dual drivers of big data and fast data spark new questions about how we manage this growing diversity of content, transactions, feeds and insights," Vervaet said. "With object storage, we can continue to scale the capacity necessary to extract deeper value from big data and deliver the higher levels of performance needed for emerging technologies made possible by fast data." 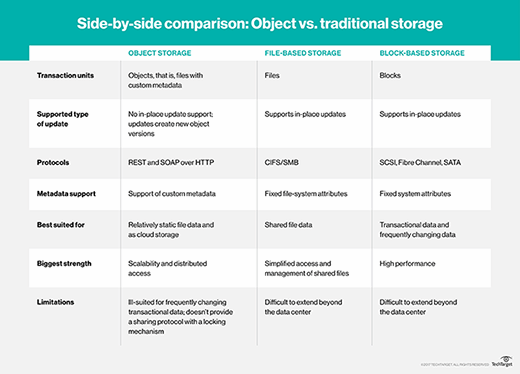 What advantages of object storage are most appealing to you? I think it is better with Scale out NAS and we have been living with NAS for long time. Eventual consistency is always a compromise.